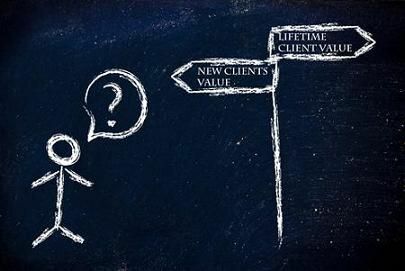 Lifetime value of customers: Lifetime value indicates how much an individual is likely to spend with your company during the period they remain a customer. You can get a basic idea of lifetime value by multiplying the average purchase amount by the number of purchases per year, then multiplying that number by the number of years the individual continues to be your customer. For example, a purchase of $10 each week over a five-year period means a lifetime value of $2,600. Cost to acquire a new customer: This number indicates how much of your marketing expenditures result in new customers. An advertisement that costs $500 and results in 10 sales costs $50 per new customer. Average dollar sale: This indicates how much each customer spends per sale, on average. Add-ons and up-sells can quickly and easily increase this number and boost profits. Conversion rates: This number shows how well prospects are being converted to customers by your advertising and marketing. For example, if a coupon offer to 500 people results in 20 sales, you have a 4 percent conversion rate. Response rates: The number of people who respond to a direct mail or email piece indicate the response rate. Lead-to-sales ratio: This shows you how many potential customers you need to contact to generate the number of sales that will sustain your business. If you need 10 new clients per month and it takes 100 prospects to get them, your ratio is 10:1. Touches to sale: This number indicates how many times a customer needs to be contacted — the number of touches needed — to produce a sale. In general, the first touch produces only 2 percent of sales. On average, it takes five contacts to produce 80 percent of sales. Do you know how these numbers influence business growth and client retention at your company? Pingback: The Client Retention Formula Every Business Should Know | Continuity Programs Inc.